Hair loss is a major concern for many patients, whether it is caused by age, genetics, hormones, medical conditions, or from years of overstyling. With recent advances in research in the hair restoration field, new treatments have been created to help combat the problem. Platelet-rich plasma, or PRP, is a state-of-the-art nonsurgical procedure that produces remarkable effects in slowing down, stopping, and reversing hair loss. PRP has shown promising outcomes in patients with alopecia areata and thinning eyebrows. Ponte Vedra Plastic Surgery is one of only a few practices to provide this innovative therapy in Jacksonville, FL. By blending a powerful solution of growth factors and bioactive proteins, we can help strengthen the function of your hair, leading to longer, thicker, healthier locks. Any patient suffering from hair loss is essentially an excellent candidate for PRP hair therapy, but those with early hair loss typically yield the most favorable results. PRP is best used for patients with androgenic alopecia, which is a genetically determined type of hair thinning that mostly occurs along the top of the head. In women, this can look like a widening part with regular hair thickness at the back of the head. Patients with parts of "weak quality” hair growth on the scalp — with still functioning hair follicles — have the greatest results with PRP hair regrowth treatments. A minimally invasive procedure, the PRP therapy is a short 60-minute in-office visit. The session begins with drawing a small amount of your blood and placing it in a special machine, which circulates the blood at high speed to separate the platelets from the remainder of the blood components. Next, a local anesthetic is used on your scalp and the concentrated platelet-rich plasma is reintroduced into parts of your scalp that are thinning or bald. Finally, microneedling is performed on the scalp to create micro-trauma and micro-channels into the skin, which activates the PRP and enables it to penetrate deep into the dermis. Our protocol for nonsurgical management of hair loss includes an initial treatment and maintenance treatments about every nine months to one year. 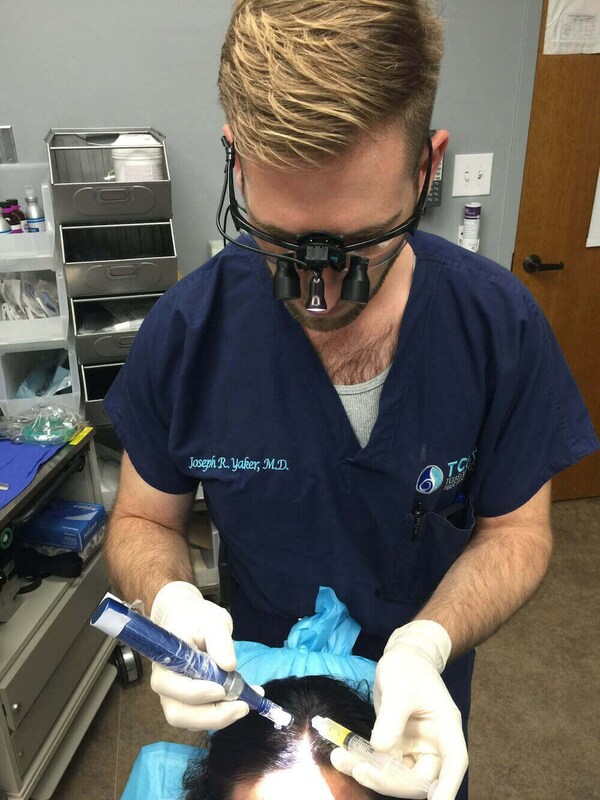 There is no downtime following this procedure, with practically no limitations or restrictions. If anything, patients may develop some redness, minimal swelling, and mild tenderness to the treated areas. These symptoms might last up to 48 hours. While results differ for each patient, cosmetic results are commonly seen around 4 – 6 months after the first treatment and may continue to improve up to a full year following treatment. As PRP is not a permanent option for hair loss, repeat treatments are highly recommended every 12 – 18 months. It is essential to remember that PRP does not grow new hair follicles in places where you are already bald. It is used to reverse the miniaturization of hair follicles so they will produce healthier, thicker, longer hair fibers. Many patients combine other treatments with PRP therapy, including topical medication applied at home, microneedling, and more. We will assess your scalp and level of hair loss before creating your custom PRP therapy treatment plan. We will also discuss our recommendations for what in-office treatments are best for your hair loss and any home products that might help between appointments. Most patients need at least three PRP treatments performed one month apart to see results. Your specific PRP therapy program will depend on the degree of hair loss and your goals. Based on this, we can recommend how many PRP treatments you will need and how often you should schedule them to stimulate your hair growth. If your condition is more advanced, we may recommend more treatment initially, which can be performed less frequently once you begin to see results. The outcomes of your PRP therapy will depend on the severity of your hair loss, how many treatments you get, and other factors. You should also remember to be patient with your results, as it takes time for new hair growth to become visible after the PRP stimulates the process. During your consultation, we will discuss if you are a good candidate and what results you can realistically expect. You may need to continue to get PRP therapy to maintain your results and limit future hair loss. While the serum is being prepared, a numbing serum will be applied to your scalp to keep you comfortable during the PRP injections. This should minimize your discomfort during the procedure, but talk to us if you have any concerns or pain. Your scalp may remain numb or tingle for a while after your PRP injections, but this is temporary and normal sensation should return shortly. PRP therapy costs will depend on many factors, including how many treatments you are getting. During your consultation, we will create your PRP treatment plan to maximize your results. Then, we can discuss the cost of your PRP therapy. We will also tell you about any current specials being offered and which payment methods Ponte Vedra Plastic Surgery accepts. PRP therapy is a scientifically backed choice for people struggling to decide between hair loss solutions. At Ponte Vedra Plastic Surgery, we are proud to provide innovative solutions to efficiently treat thinning hair. To hear more about PRP treatment sessions, we ask you to call our Jacksonville, FL office today.